I don’t know about you, but I love cooking in the crockpot. Especially when the chilly weather hits, I just looove the smell of something good wafting through the air! This meal was no exception. It came on the heels of my recent Miami trip, where I saw lots of Cuban food and people too! I still have visions of the Cuban ladies dancing on the bow of the boats while cruising along the bay, music blaring. While boating one day, we stopped for lunch at this amazing little waterfront spot and had some excellent beans and rice (and of course seafood), which I’m looking forward to trying to make at home. 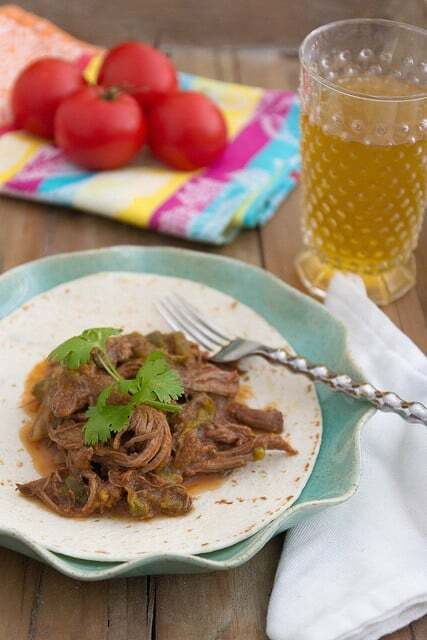 Although this beef dish wasn’t something that we tried in Miami, when I came across this recipe online, I thought I’d give it a try since it’s an easy meal to prepare. The addition of pepper and onion puts a little different spin on it for me. It reminded me a lot of pepper steak. Serve this up with beans and rice and salad for a hearty cold-weather dinner. 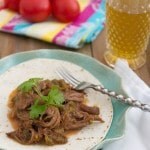 The beef works well wrapped in a tortilla with sour cream, cheese, and cilantro, although you can totally just eat in plain too. Remove meat from pan, and add to crock pot along with all other remaining ingredients. Cook on low for 8 to 10 hours or high for 3 to 4 hours. Serve with tortillas, sour cream, and cheese if desired.